Paper Stamp Scissors: More Snowflakes??? Does anyone know what happened to February? Some days seemed really long, but the month just flew by. Still a little snowy in these parts and, while I am wishing for spring, the snow makes it easy to 'work' on Christmas cards. Other - Picket Fence crackle paint, Stampin Up iridescent ice embossing powder (snowflakes and edges of ticket), Stardust stickles, snow marker and dazzling diamonds glitter (on the hat). Funky Kits has given us two Gorjuss Girl stamps from Personal Impressions to give away to one lucky winner! 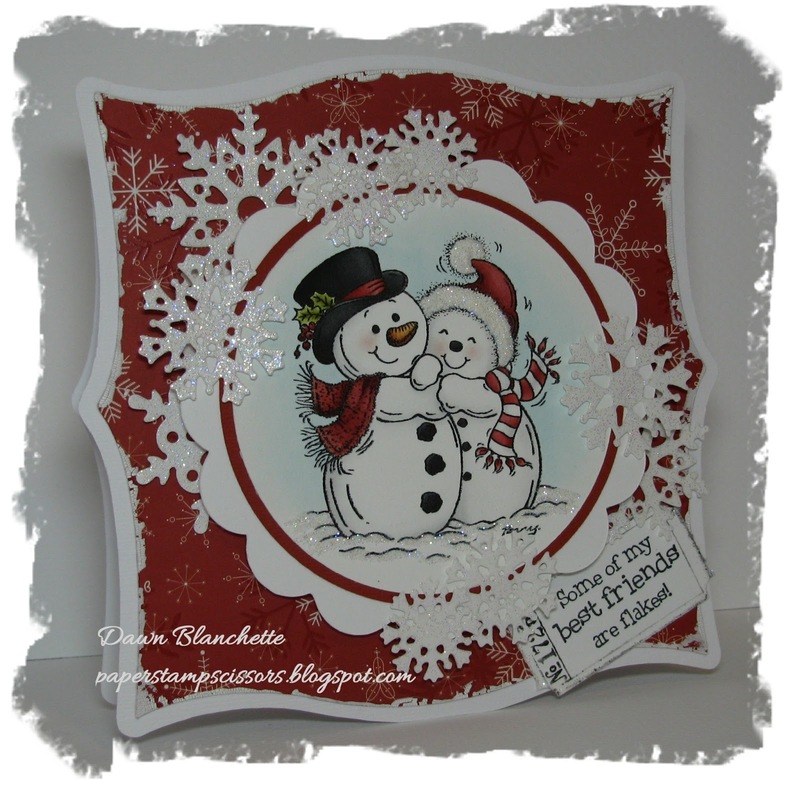 Pop by the Christmas at Sweet Stampin Challenge to check out the prize, be inspired by the talented team's creations and join in the fun. I'm looking forward to visiting and seeing your wonderful creations. Thanks so much for popping by and for taking the time to leave a comment. I love reading them and having the chance to visit you back. Awwwww I LOVE those cute snowmen, so romantic! The colours and sparkle are gorgeous and the sentiment is beautiful. Lovely card. Loved it! Thanks for joining CHNC extra challenge this month. I can see why you keep using this image, it is really sweet. Love your card and thanks for joining us at ABC Christmas Challenges and best of luck! I just love these sweet snowpeople. Thank you for joining us at Winter Wonderland. Gorgeous card Dawn. Love that image. 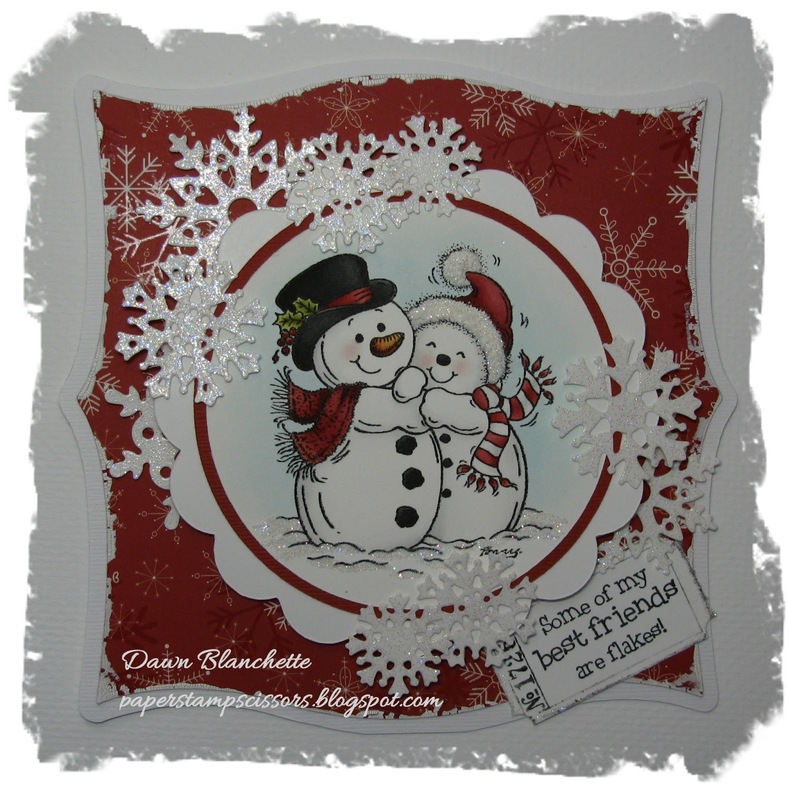 What a lovely card and such a sweet image! The sparkles are beautiful! Thanks for playing along at CCC! Thank you for joining our 'D for Design Paper' at ABC Christmas Challenge.